It’s a small wonder that nobody thought of it before, but the 2014 Honda Odyssey is actually the first vehicle in the U.S. to be available with a built-in vacuum. Since minivans are most often used as family vehicles – and family vehicles tend to get a bit messy now and then – the addition of a vacuum to the new Odyssey is a common-sense innovation that helps set it apart from the rest. 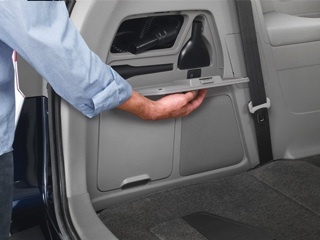 The HondaVAC is built into the driver’s side of the Odyssey’s cargo area, and comes with a hose and two attachments designed to help you clean all of the minivan’s nooks and crannies. You can run the HondaVAC continuously while the engine is running, or you can use it for up to eight minutes when the engine is off. Why Add a Vacuum to a Minivan? Honda says the idea came from one of their engineers – or, more specifically, from his child. The story goes that the engineer noted the crumbs and other material that builds up during a long family drive, and his child suggested that the car should have a vacuum cleaner. The rest is history. It’s a simple idea, but the HondaVAC will have a big impact in terms of helping you keep your new Odyssey clean. To see how it works up close, come visit us at Brilliance Honda of Crystal Lake!